The Roman salute (Saluto Romano) is a gesture in which the arm is held out forward straight, with palm down, and fingers touching. In some versions the arm is raised upward at an angle, in others it is held out parallel to the ground. It is a well known symbol of fascism that is commonly perceived to be based on a custom in ancient Rome. However, no Roman text gives this description and the Roman works of art that display salutational gestures bear little resemblance to the modern salute. Jacques-Louis David's painting The Oath of the Horatii (1784) provided the starting point for the gesture that became later known as the Roman Salute. The gesture and its identification with Roman culture was further developed in other French neoclassic artworks. This was further manifested in popular culture during the late 19th and early 20th century in plays and films that portrayed the salute as an ancient Roman custom. It included a film called Cabiria that is a based on a screenplay by the Italian nationalist Gabriele d'Annunzio. In 1919, d'Annunzio adopted the cinematographically depicted salute as a neo-imperial ritual when he led the occupation of Fiume. Through d'Annunzio's influence, the gesture soon became part of the Italian fascist movement's symbolic repertoire. In 1923 the salute was gradually adopted by the Italian Fascist regime. It was made compulsory within the Nazi party in 1926, and adopted by the German state when the Nazis took power in 1933. It was also adopted by other fascist movements. Since World War II, the salute has been a criminal offense in Germany and Austria. Legal restrictions on its use in Italy are more nuanced, and use there has generated controversy. It had been used in films to depict Ancient Rome as a proto-fascist state. The gesture and its variations continue to be used in neo-fascist contexts. The modern gesture consists of stiffly extending the right arm frontally and raising it roughly 135 degrees from the body’s vertical axis, with the palm of the hand facing down and the fingers stretched out and touching each other. According to common perceptions, this salute was based on an ancient Roman custom. However, this description is unknown in Roman literature and is never mentioned by ancient historians of Rome. Not a single Roman work of art, be it sculpture, coinage, or painting, displays a salute of this kind. The gesture of the raised right arm or hand in Roman and other ancient cultures that does exist in surviving literature and art generally had a significantly different function and is never identical with the modern straight-arm salute. "Although that youth [the young Caesar Octavian] is powerful and has told Antony off nicely: yet, after all, we must wait to see the end." But what a speech! He swore his oath with the words: "so may I achieve the honours of my father! ", and at the same time he stretched out his right in the direction of his statue. Sculptures commemorating military victories such as those on the Arch of Titus, the Arch of Constantine, or on the Column of Trajan are the best known examples from art. However these monuments do not display a single clear image of the Roman salute. 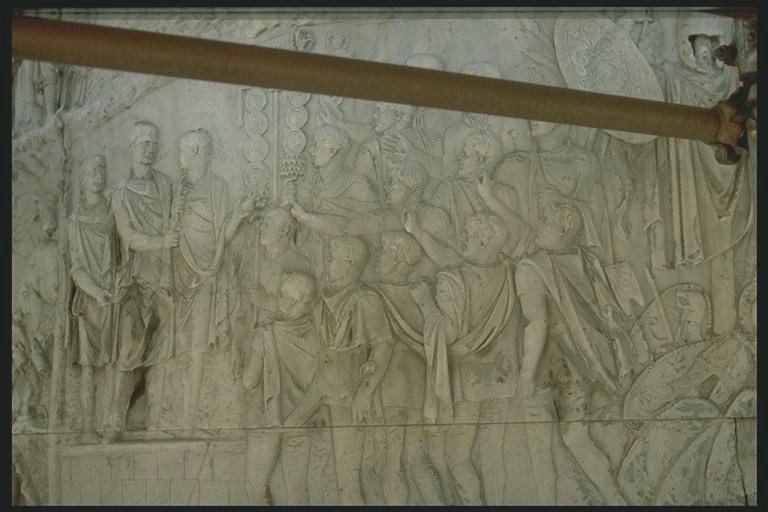 For example, three such scenes have been analyzed on Trajan's Column. On plate 99 (LXII, Scenes LXXXIV-LXXXV), six onlookers have their hand raised to Trajan, half extended straight, half bent at the elbow. On the ones with straight arms, only one palm is open but held vertically. The fingers of the three with bent arms are pointed downward. On Plate 167 (CII, Scene CXLI), three Dacians extend their right arms toward the emperor, their open hands held vertically and their fingers spread. None of the Romans are returning their gesture. On plates 122-123(LXXIV-LXXVI, Scenes CI-CII), the emperor on horseback is greeted by a unit of legionaries. None of the 15 legionaries is raising his entire arm. An officer facing Trajan has his arm close to his body, the lower arm raised, his index finger pointing up, and the other fingers closed. Behind him, two right hands are raised with fingers spread wide. Trajan himself holds his upper right hand close to his body, extending only the lower arm. The images closest in appearance to a raised arm salute are scenes in Roman sculpture and coins which show an adlocutio, acclamatio, adventus, or profectio. These are occasions when a high ranking official, such as a general or the Emperor, addresses individuals or a group, oftentimes soldiers. Unlike modern custom, in which both the leader and the people he addresses raise their arms, most of these scenes show only the senior official raising his hand. Occasionally it is a sign of greeting or benevolence, but usually it is used as an indication of power. An opposite depiction is the salutatio of a diogmites, a military police officer, who raises his right arm to greet his commander during his adventus on a relief from second-century Ephesus. Experts do not permit the hand to be raised above the level of the eyes or lowered beneath the breast; to such a degree is this true that it is considered a fault to direct the hand above the head or lower it to the lower part of the belly. It may be extended to the left within the limits of the shoulder, but beyond that it is not fitting. Jacques-Louis David's painting The Oath of the Horatii (1784) provided the starting point for the gesture that became later known as the Roman Salute. The painting shows the three sons of Horatius swear on their swords, held by their father, that they will defend Rome to the death. It is based on an historical event described by Livy (Book I, sections 24-6) and elaborated by Dionysius in Roman Antiquities (Book III). However, the moment depicted in David's painting is his own creation. Neither Livy nor Dionysius mention any oath taking episode. Dionysius, the more detailed source, reports that the father had left to his sons the decision to fight then raised his hands to the heavens to thank the gods. Dominating the center of the The Oath of the Horatii is the brothers' father, facing left. He has both hands raised. His left hand is holding three swords, while his right hand is empty, with fingers stretched but not touching. The brother closest to the viewer is holding his arm almost horizontally. The brother on the left is holding his arm slightly higher, while the third brother holds his hand higher still. While the first brother extends his right arm, the other two are extending their left arms. The succession of arms raised progressively higher leads to a gesture closely approximating the style used by fascists in the 20th century in Italy, albeit with the "wrong" arms. The brothers stretch out their arms in a salute that has since become associated with tyranny. The "Hail Caesar" of antiquity (although at the time of the Horatti a Caesar had yet to be born) was transformed into the "Heil Hitler" of the modern period. The fraternal intimacy brought about by the Horatii's dedication to absolute principles of victory or death ... is closely related to the establishment of the fraternal order ... In the total commitment or blind obedience of a single, exclusive group lies the potentiality of the authoritarian state." After the French Revolution of 1789, David was commissioned to depict the formation of the revolutionary government in a similar style. In the Tennis Court Oath (1792) the National Assembly are all depicted with their arms outstretched, united in an upward gesture comparable to that of the Horatii, as they swear to create a new constitution. The painting was never finished, but an immense drawing was exhibited in 1791 along side the Oath of the Horatii  As in the Oath of the Horatii, David conveys the unity of minds and bodies in the service of the patriotic ideal. But in this drawing, he takes the subject further, uniting the people beyond just family ties and across different classes, religions, and philosophical opinions. After the republican government was replaced by Napoleon's imperial régime, David further deployed the gesture in The Distribution of the Eagle Standards (1810). But unlike his previous paintings representing republican ideals, in Eagle Standards the oath of allegiance is pledged to a central authority figure, and in imperial fashion. Boime sees the series of oath pictures as "the coding of key developments in the history of the Revolution and its culmination in Napoleonic authoritarianism". The imperial oath is seen in other paintings, such as Jean-Léon Gérôme's Ave Caesar! Morituri te salutant (Hail, Caesar, those who are about to die salute you) of 1859. In this painting, the gladiators are all raising their right or left arms, holding tridents and other weapons. Their salutation is a well-known Latin phrase quoted in Suetonius, De Vita Caesarum ("The Life of the Caesars", or "The Twelve Caesars"). Despite becoming widely popularized in later times, the phrase is unknown in Roman history aside from this isolated use, and it is questionable whether it was ever a customary salute, as is often believed. It was more likely to be an isolated appeal by desperate captives and criminals condemned to die. On October 12, 1892, the Bellamy salute was demonstrated as the hand gesture to accompany the Pledge of Allegiance in the United States. The inventor of the saluting gesture was James B. Upham, junior partner and editor of the The Youth's Companion. Bellamy recalled Upham, upon reading the pledge, came into the posture of the salute, snapped his heels together, and said "Now up there is the flag; I come to salute; as I say 'I pledge allegiance to my flag,' I stretch out my right hand and keep it raised while I say the stirring words that follow." Because of the similarity between the Bellamy salute and the Nazi salute that emerged in Germany in 1920s, President Franklin D. Roosevelt instituted the hand-over-the-heart gesture as the salute to be rendered by civilians during the Pledge of Allegiance and the national anthem in the United States, instead of the Bellamy salute. This was done when Congress officially adopted the Flag Code on 22 June1942. There was initially some resistance to dropping the Bellamy salute, for example from the Daughters of the American Revolution. The gesture, already established in the United States through the Bellamy salute, has been traced to the Broadway production of the play Ben-Hur. The play, based on Lew Wallace's book Ben-Hur: A Tale of the Christ, opened on Broadway in November, 1899 and proved to be a great success. Photographs show several scenes using the gesture, including one of Ben-Hur greeting a seated sheik and another of a small crowd so greeting Ben-Hur in his chariot. Neither Wallace's novel nor text for the theatrical production mentions a raised arm salute. The salute was evidently added in keeping with the exaggerated style of acting in nineteenth century theater, which in turn influenced acting in the silent cinema. The salute frequently occurs in films set in antiquity, such as the American Ben-Hur (1907) and the Italian Nerone (1908), although such films do not yet standardize it or make it exclusively Roman. In Spartaco (1914), even the slave Spartacus uses it. Later examples appear in Ben-Hur (1925) and in Cecil B. DeMille’s Sign of the Cross (1932) and Cleopatra (1934), although the execution of the gesture is still variable. Of special note is the use in Giovanni Pastrone’s colossal epic Cabiria (1914). The screenplay was attributed to Italian nationalist Gabriele d'Annunzio, who was known as the "poet-warrior". Inspired by the Italo-Turkish War, in which Italy conquered the North African Ottoman province of Tripolitania, Pastrone perused a politically volatile issue. The film highlights Italy's Roman past and the "monstrous" nature of Carthaginian society, which is contrasted with the "nobility" of Roman society. Cabiria was one of several films of the period that "helped resuscitate a distant history that legitimized Italy's past and inspired its dreams" and which "delivered the spirit for conquest that seemed to arrive from the distant past", thereby presaging the "political rituals of fascism", "thanks..to its prime supporter and apostle, Gabriele d'Annunzio." Variations on the salute occur throughout Cabiria on the part of Romans and Africans. Scipio uses the gesture once. Furius Axilla, the stories fictitious hero, twice employs it as a farewell greeting to his hosts. The Numidian king Massinissa, guest of the Carthaginian Hasdrubal, raises his right hand and is so greeted in return, once by the strongman Maciste. Princess Sophonisba and King Syphax mutually great each other by raising their hands and declining their bodies. The diversity of the gesture and the variety of nationalities who use it in Cabria is seen as further evidence that the salute is a modern invention, used in the film to exhibit the exotic nature of antiquity. Benito Mussolini and Hitler, Mussolini giving the Roman salute. D'Annunzio, who had scripted Cabiria, appropriated the salute when he occupied Fiume in 1919. D'Annunzio has been described as the John the Baptist of Italian Fascism, as virtually the entire ritual of Fascism was invented by D'Annunzio during his occupation of Fiume and his leadership of the "Italian Regency of Carnaro". Besides the Roman salute, these included the balcony address, the cries of "Eia, eia, eia! Alala! ", the dramatic and rhetorical dialogues with the crowd, and the use of religious symbols in new secular settings. Like other neo-Imperial rituals utilized by D'Annunzio, the salute became part of the Italian fascist movement's symbolic repertoire. On January 31, 1923, the Ministry of Education instituted a ritual honoring the flag in schools using the Roman salute. In 1925, as Mussolini began his fascitization of the state, the salute was gradually adopted by the regime, and by December 1, 1925 all state civil administrators were required to use it. Achille Starace, the Italian Fascist Party secretary, pushed for measures to make the use of the Roman salute generally compulsory, denouncing hand shaking as bourgeois.. He further extolled the salute as "more hygienic, more aesthetic, and shorter." He also suggested that the Roman salute did not imply the necessity of taking off the hat unless one was indoors. By 1932, the salute was adopted as the substitute for the handshake. On August 19, 1933 the military was ordered to use the salute whenever an unarmed detachment of soldiers was called on to render military honors for the King or Mussolini. The symbolic value of the gesture grew, and it was felt that the proper salute "had the effect of showing the fascist man's decisive spirit, which was close to that of ancient Rome". The salute was seen to demonstrate the fascist's "decisive spirit, firmness, seriousness, and acknowledgment and acceptance of the regime's hierarchical structure". It was further felt that the correct physical gesture brought forth a change in character. The bourgeois gesture was supposed to disappear from the view of Italians and not contaminate their daily life. In 1938, the party abolished handshaking in films and theater, and on November 21, 1938 the Ministry of Popular Culture issued orders banning the publishing of photographs showing people shaking hands. Even official photographs of visiting dignitaries were retouched to remove the image of their handshaking. In Germany the salute, sporadically used by the National Socialist German Workers Party (NSDAP) since 1923, was made compulsory within the movement in 1926. Called the Hitler salute (Hitlergruß), it functioned both as an expression of commitment within the party and as a demonstrative statement to the outside world. Yet in spite of this demand for the outward display of obedience, the drive to gain acceptance did not go unchallenged, even within the movement. Early objections focused on its resemblance to the Roman salute employed by Fascist Italy, and hence on it not being Germanic. In response, efforts were made to establish its pedigree and invent a proper tradition after the fact. The compulsory use of the Hitler salute for all public employees followed a directive issued by Reich Minister of the Interior Wilhelm Frick on July 13, 1933, one day before the ban on all non-Nazi parties. The Wehrmacht refused to adopt the Hitler salute and was able for a time to maintain its own customs. The military were required to use the Hitler salute only while singing the Horst Wessel Lied and German national anthem, and in non-military encounters such as greeting members of the civilian government. Only after the July 20 Plot in 1944 were the military forces of the Third Reich ordered to replace the standard military salute with the Hitler salute. Similar forms of salutes were adopted by various groups. It's use in France dates back to 1925, when the Jeunesses Patriotes (Patriotic Youth), a movement led by Pierre Taittinger, would give the fascist salute at meetings while shouting "Dictatorship!". Marcel Bucard's Mouvement Franciste, founded in September 1933 adopted the salute as well donning blue shirts and blue berets. François Coty's Solidarité Française used the salute as well, though its leaders denied the movement was fascist. By 1937, rivalry amongst French right wing parties sometimes caused confusion over salutes. The Parti Populaire Français, generally regarded as the most pro-Nazi of Frances collaborationist parties, adopted a variant of the salute that distinguished itself from other's by slightly bending the hand and holding it at face level. On April 27, 1937, Francisco Franco formally approved the salute in a decree making it the official salutation in areas held by his falangists in Spain. After a meeting with Mussolini, in December 1937, Croation Prime Minister Milan Stojadinović adopted a version of the salute as he took to styling himself as Vodja (Leader). On January 4, 1939 the salute of raising one arm was adopted in Romania under a statute promulgating the Romanian Front of National Rebirth. In Slovakia, the Hlinka Guard's Na stráž! (On guard!) consisted of a half-hearted compromise between a friendly wave and salute with a straight raised arm. Members of the Brazilian Integralism movement during the 1930s used to salute by raising one arm. The Salute was called word "Anauê" - a word used as a salutation and as a cry by the Brazilian indigenous tupi people, meaning "you are my brother". The Italian constitution forbids the reconstituion of the fascist party. According to the Scelba Law, passed June 20, 1952, such a reconstitution occurs when five or more people support undemocratic goals. On June 25, 1993 the Mancino law extended the prohibition to all forms of racial, ethnic, and religious discrimination. Public demonstrations, meetings, and publications of such a kind are banned. Sanctions include being barred from sporting events, and suspension of drivers licenses and passports. These laws, however, are difficult to enforce and seldom used. The salute has been used many times by prominent individuals as well as the masses since the war. After being released from an insane asylum in the United States, famed poet Ezra Pound returned to Italy in July, 1958 and hailed his adopted country with the fascist salute. The salute was on display in the 1968 funeral for Mussolini's youngest daughter, Mrs Anna Maria Mussolini Negri. When the Italian Social Movement had it's greatest electoral gains since the Second World War in June, 1971, crowds at the party headquarters cheered and gave the outstretched arm salute. On July 29, 1983, on the 100th anniversary of Mussolini's birth, thousands of black-shirted supporters chanted DUCE! DUCE! with their arms raised in the fascist salute on a march from his native village of Predappio in Romagna to the cemetery where he was buried. On the eve of Silvio Berlusconi's election victory in 1994, young supporters of Gianfranco Fini made the fascist salute while chanting "Duce! Duce!" In 2005, Italian footballer Paolo Di Canio created controversy by twice using the gesture to salute S.S. Lazio fans, first in a match against arch rivals A.S. Roma (a team widely supported by Rome's Jewish population) and then against A.S. Livorno Calcio (a club inclined to leftist politics). Di Canio received a one match game ban after the second event and was fined 7,000 Euros, after which he was quoted as saying "I will always salute as I did because it gives me a sense of belonging to my people..I saluted my people with what for me is a sign of belonging to a group that holds true values, values of civility against the standardisation that this society imposes upon us." His salute featured on unofficial merchandise sold outside Stadio Olimpico after the ban. Lazio was Mussolini's favorite team. Di Canio has also expressed admiration for Mussolini. Use of the salute and accompanying phrases has been forbidden by law in Germany since the end of World War II. Section 86 of the German Penal Code provides for punishment of up to three years in prison for anyone using the salute, unless it is used artistic, scientific, or educational purposes. A large number of films made after World War II has made the Roman salute a visual stereotype of a proto-fascist ancient Roman society. In the 1951 film Quo Vadis (1951), Nero's repeated use of the salute at mass rallies explicitly presents the Roman Empire as a Fascist military state. The movie provided other filmmakers of the time a model, with notable examples including Ben-Hur (1959), Spartacus (1960), and Cleopatra (1963). The last epic film of that era, The Fall of the Roman Empire (1964), went against the stereotypical presentation of Rome. The salute is still used but it is generally given in a less stiff, militaristic fashion. Furthermore, it is notably absent in scenes when an assembly or crowd gives a Hail Caesar to Marcus Aurelius. Not until Gladiator (2000) did the Roman epic return to the cinema. In this movie, the salute is notably absent in most scenes, for example when Commodus enters Rome or when the Senate salutes the Emperor by head-bowing. The Tamil separatist organization LTTE were understood to use a salute with one straight, raised arm while saluting their leader Velupillai Prabhakaran in 2003. 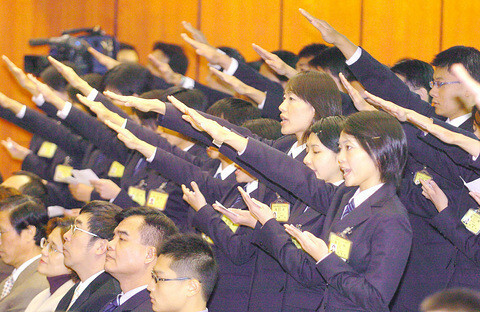 Variations on the salute also appear in neo-fascist contexts. For example, The Christian Falangist Party, founded in 1985, uses a “pectoral salute,” in which the right arm, bent at the elbow, is extended from the heart, palm down.. This gesture was used in François Truffaut's 1966 film Fahrenheit 451. The film portrays a futuristic totalitarian society modeled after the fascist state, including black uniforms, book burnings, and thought control. In the Star trek episode Mirror Mirror, the salute begins with the right fist being placed over the heart, as in a pectoral salute, and then the arm is stretched out (usually up) before the body, open palm down, as in a traditional Roman salute.. In the episode, Captain Kirk and members of his crew are transported to a parallel universe in which the United Federation of Planets has been replaced by an empire characterized by sadistic violence and torture, genocide, and unquestioning obedience to authority. ^ K.E. Georges, Ausführliches lateinisch-deutsches Handwörterbuch, Leipzig, Hahn'sche Verlags-buchhandlung Lateinisch-deutscher theil. 1879-80. 2 v.--Deutsch-lateinischer theil 1882 2 v (reprint Berlin 2007) , s.v. "dexter"; cf. Lewis-Short s.v. "dextera"; cf. LSJ s.v. "δεξιά". ^ a b c d e Coarelli, Filippo; Paul Zanker, Bruno Brizzi, Cinzia Conti, Roberto Meneghini, Deutsches Archäologisches Institut (2000). Filippo Coarelli. ed. The Column of Trajan (Translated by Cynthia Rockwell ed.). Colombo. pp. 143,166,211. ISBN 8886359373, 9788886359375. ^ Probably as an acclamatio; note palm is perpendicular to the ground and thumb is sticking up cf. Graham Sumner, Roman military clothing: 100 BC - AD 200, Oxford 2002, p. 47, pl. G3 (Diogmitoi [sic! correct plural: diogmitai]). ^ a b c Moon, Warren G. (1995). Polykleitos, the Doryphoros, and tradition. Wisconsin studies in classics (illustrated ed.). Univ of Wisconsin Press. pp. 271–272. ISBN 0299143104, 9780299143107. ^ a b c d e Boime, Albert (1987). Art in an age of revolution, 1750-1800. Social history of modern art. Volume 1. University of Chicago Press. pp. 400–401. ISBN 0226063348, 9780226063348. ^ a b Roth, Michael (1994). "Facing the Patriarch in Early Davidian Painting". Rediscovering history: culture, politics, and the psyche. Stanford University Press. pp. 308. ISBN 0804723133, 9780804723138. ^ Marvin, Roberta Montemorra; Downing A. Thomas (2006). "Roman Republicanism and Operatic Heroines". Operatic migrations: transforming works and crossing boundaries (illustrated ed.). Ashgate Publishing, Ltd.. pp. 102–103. ISBN 0754650987, 9780754650980. ^ Boime, Albert (1993). Art in an age of Bonapartism, 1800-1815. Social history of modern art. 2 (reprint, illustrated ed.). University of Chicago Press. pp. 46. ^ Baker, Alan (2000). The gladiator: the secret history of Rome's warrior slaves. Ebury Press. pp. 84. ISBN 0091878802, 9780091878801. http://books.google.com/books?id=20YTAQAAIAAJ&q=%22morituri+te+salutant%22+Claudius&dq=%22morituri+te+salutant%22+Claudius&num=100&cd=7. ^ Kyle, Donald (2001). Spectacles of death in ancient Rome. Routledge. pp. 94. ISBN 0415248426, 9780415248426. http://books.google.com/books?id=1GYH63-fARUC&pg=PA94&lpg=PA94&dq=%22morituri+te+salutant%22+commodus&source=bl&ots=cauYF42a5g&sig=uIPtdT1EE0WpGAMV9cb2ybhYaJw&hl=en&ei=O8aYS8irNo754Abaofm7Ag&sa=X&oi=book_result&ct=result&resnum=10&ved=0CC0Q6AEwCQ#v=onepage&q=%22morituri%20te%20salutant%22%20commodus&f=false. ^ a b Miller, Margarette S. (1976). Twenty Three Words: A Biography of Francis Bellamy : Author of the Pledge of Allegiance. Natl Bellamy Award. ISBN 0686156269, 9780686156260. ^ Bishop, Ronald (2007). "A Case of First Impression". Taking on the Pledge of Allegiance: the news media and Michael Newdow's Constitutional challenge. SUNY Press. pp. 27. ISBN 0791471810, 9780791471814. ^ Leepson, Marc (2006). Flag: AnAmerican Biography. Macmillan. pp. 171. ISBN 0312323093. ^ Fried, Richard M. (1999). The Russians Are Coming! The Russians Are Coming! : Pageantry and Patriotism in Cold-War America. New York: OxfordUniversity Press (USA). pp. 12. ISBN 0-19-513417-6. ^ a b c Winkler, Martin. "The Roman Salute on Film". 2003 APA Annual Meeting (The American Philological Association (APA)) (8 January 2003). http://www.apaclassics.org/AnnualMeeting/03mtg/abstracts/Winkler.html. ^ Solomon, Jon (2001). The ancient world in the cinema (2, revised, illustrated ed.). Yale University Press. pp. 48. ISBN 0300083378, 9780300083378. ^ Wood, Mary P. (2005). Italian cinema. Berg Publishers. pp. 138. ISBN 1845201620, 9781845201623. ^ Brunetta, Gian Piero; Jeremy Parzen (2009). The History of Italian Cinema: A Guide to Italian Film from Its Origins to the Twenty-First Century. Princeton University Press. pp. 34. ISBN 0691119880, 9780691119885. ^ Paxton, Robert O. (2005). "Taking Root". The Anatomy of Fascism. Vintage Series (reprint ed.). Random House, Inc.. pp. 59–60. ISBN 1400033918, 9781400033911. ^ Wireless (August 20, 1933). "Fascist Salute Is Adopted By Italian Armed Forces". The New York Times. pp. Page 1. http://select.nytimes.com/mem/archive/pdf?res=F10B1EFB3E5B137A93C2AB1783D85F478385F9. Retrieved 1 March 2010. ^ "Fascist Salute Adopted". The Montreal Gazette. Apr 27, 1937. pp. 10. http://news.google.com/newspapers?id=Iy8rAAAAIBAJ&sjid=qZgFAAAAIBAJ&pg=2530,3492234&dq. Retrieved 14 February 2010. ^ Singelton, Frederick Bernard (1985). "The kingdom of Yugoslavia". A short history of the Yugoslav peoples (2, illustrated ed.). Cambridge University Press. pp. 167. ISBN 0521274850, 9780521274852. ^ Benson, Leslie (2001). "Destruction of the First Yugoslavia". Yugoslavia: a concise history (illustrated ed.). Palgrave Macmillan. pp. 65. ISBN 0333792416, 9780333792414. ^ Webb, Adrian (2008). "The Rise of Authoritianism 1919-1939". The Routledge companion to Central and Eastern Europe since 1919. Routledge companions to history. Routledge. pp. 153. ISBN 0203928172, 9780203928172. ^ Jelinek, Yeshayahu (1971). "Storm-Troopers in Slovakia: The Rodobrana and the Hlinka Guard". Journal of Contemporary History (Sage Publications) 6 (3): 104. ISSN 00220094. OCLC 49976309. http://www.jstor.org/stable/259881. ^ Payne, Stanley (1995). "Fascism outside Europe?". A history of fascism, 1914-1945 (2 ed.). Routledge. pp. 345. ISBN 1857285956, 9781857285956. ^ a b c d e f Klandermans, Bert; Nonna Mayer (2006). Extreme right activists in Europe: through the magnifying glass. Routledge. pp. 31. ISBN 0415358272, 9780415358279. ^ "Pound, in Italy, Gives Fascist Salute; Calls United States an 'Insane Asylum'". The New York Times. July 10, 1958. pp. 56. http://select.nytimes.com/mem/archive/pdf?res=FA0E12FF3C5F117B93C2A8178CD85F4C8585F9. Retrieved 1 March 2010. ^ "Mussolini's Followers Mourn Death of His Daughter". The New York Times. April 27, 1968. pp. 8. http://select.nytimes.com/mem/archive/pdf?res=F10613F6345D147493C5AB178FD85F4C8685F9. Retrieved 15 March 2010. ^ UPI (Jun 16, 1971). "Fascists Make Gains In Italian Elections .". Montreal Gazette. pp. 5. http://news.google.com/newspapers?id=A5kuAAAAIBAJ&sjid=tKEFAAAAIBAJ&pg=827,3985511. Retrieved 15 March 2010. ^ "Thousands Give Fascist Salute At Rally To Honor Mussolini .". Montreal Gazette. Jul 30, 1983. http://news.google.com/newspapers?id=SRUyAAAAIBAJ&sjid=RKUFAAAAIBAJ&pg=931,2855714. Retrieved 15 March 2010. ^ COWELL, ALAN (March 31, 1994). "Italy's Neo-Fascists: Have They Shed Their Past?". The New York Times. http://www.nytimes.com/1994/03/31/world/italy-s-neo-fascists-have-they-shed-their-past.html?pagewanted=1. Retrieved 15 March 2010. ^ a b c Bar-On, Tamir (2007). Where have all the fascists gone?. Ashgate Publishing, Ltd.,. pp. 1. ISBN 0754671542, 9780754671541. ^ a b Kassimeris, Christos (2008). European football in black and white: tackling racism in football. Rowman & Littlefield. pp. 70. ISBN 0739119605, 9780739119600. ^ Nursey, James (Dec 19, 2005). "Football: ll Di Canio new salute row". The Daily Mirror; London (UK),. http://findarticles.com/p/news-articles/daily-mirror-the-london-uk/mi_8006/is_20051219/football-ll-di-canio-salute/ai_n40766979/. Retrieved 28 February 2010. ^ Duff, Mark (9 January 2005). "Footballer's 'fascist salute' row". BBC News. http://news.bbc.co.uk/2/hi/europe/4158591.stm. Retrieved 16 February 2010. ^ Fenton, Ben (24 Dec 2005). "I'm a fascist, not a racist, says Paolo di Canio". Telegraph. http://www.telegraph.co.uk/news/1506262/Im-a-fascist-not-a-racist-says-Paolo-di-Canio.html. Retrieved 16 February 2010. ^ a b c d AP foreign (Wednesday June 17 2009). "Italy official in row over apparent fascist salute". The Guardian. http://www.guardian.co.uk/world/feedarticle/8563250. Retrieved 15 March 2010. Allert, Tilman; Translated by Jefferson Chase (April 2009). The Hitler Salute: On the Meaning of a Gesture (Picador ed.). Picador. ISBN 0312428308, 9780312428303. Falasca-Zamponi, Simonetta (2000). Fascist spectacle: the aesthetics of power in Mussolini's Italy. Studies on the history of society and culture. 28 (illustrated ed.). University of California Press. ISBN 0520226771, 9780520226777. Kershaw, Ian (2001). The "Hitler myth": Image and reality in the Third Reich (2, reissue ed.). Oxford University Press. ISBN 0192802062, 9780192802064. Ledeen, Michael Arthur (2001). D'Annunzio: the first duce (2, illustrated ed.). Transaction Publishers. ISBN 0765807424, 9780765807427. Parker, Noel (1990). Portrayals of revolution: images, debates, and patterns of thought on the French Revolution (illustrated ed.). SIU Press. ISBN 0809316846, 9780809316847. Soucy, Robert (1997). French Fascism: The Second Wave, 1933-1939 (illustrated ed.). Yale University Press. ISBN 0300070438, 9780300070439. Winkler, Martin M. (2009). The Roman Salute: Cinema, History, Ideology. Columbus: Ohio State University Press. ISBN 0814208649, 9780814208649.